Smoke from the Camp Fire in Butte County continues to impact our local air quality. 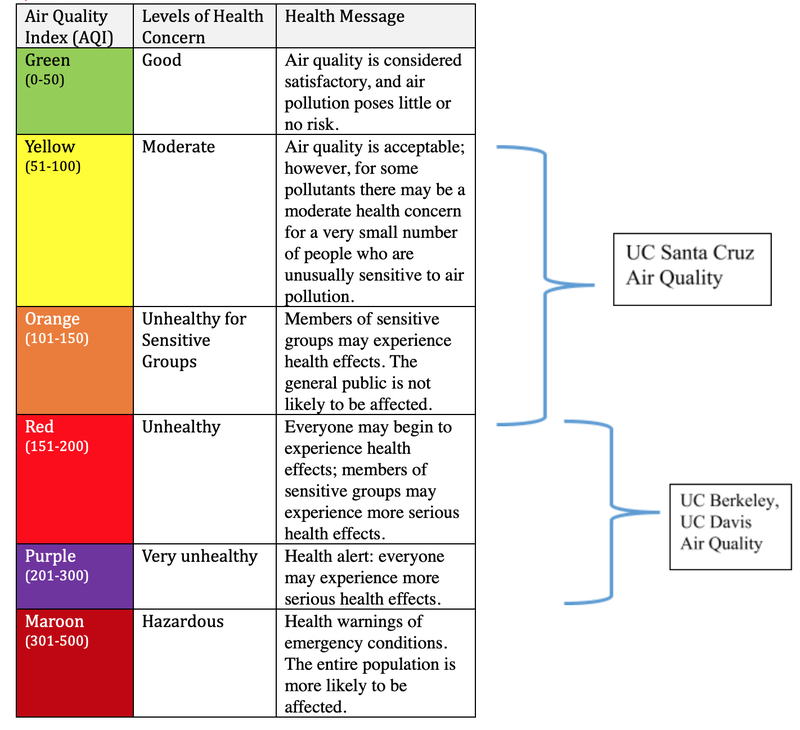 The Air Quality Index (AQI) continues to indicate that Santa Cruz air quality is in the “Unhealthy for Sensitive Groups” range, with a corresponding health message stating “People with heart or lung disease, older adults, and children should reduce prolonged or heavy exertion.” Note that air quality has been fluctuating, and the AQI for Santa Cruz is likely to continue changing over the next few days. The chart to the right shows air quality levels over the past 48 hours. UC Davis and UC Berkeley are closer to the smoke plume from the Butte County fires and have experienced air quality levels in the “Very Unhealthy” (AQI >200) range. As a precautionary measure, Davis and Berkeley have cancelled classes for today. 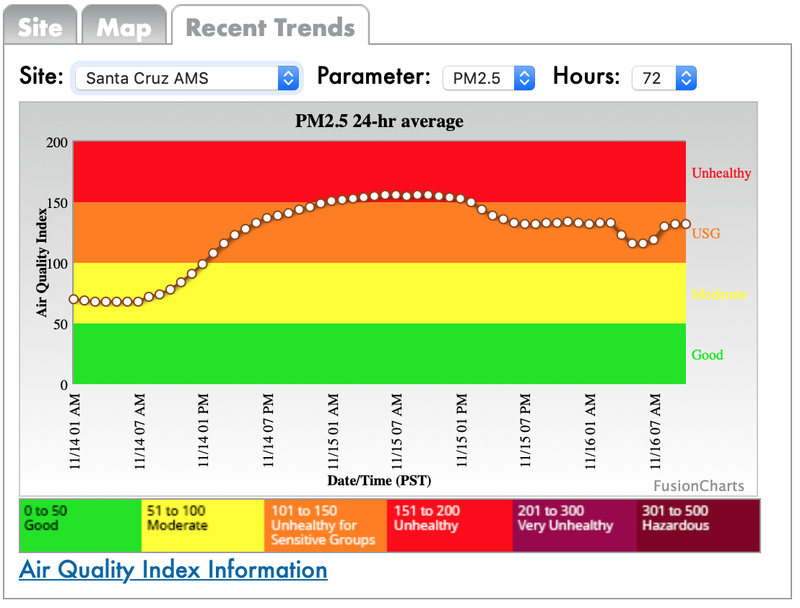 Because UC Santa Cruz is farther from the smoke plume, we do not expect the AQI to exceed 200. Consequently, the campus continues to remain open. We will continue to assess this situation with respect to any negative changes in air quality and the possible need to close the campus. A message specific to employees working at the UC Santa Cruz Silicon Valley Campus will be sent soon. Even low smoke concentrations can be irritating, and some people will be more sensitive than others to the odor and discomfort. Anyone with health concerns should contact their medical provider. Environmental Health & Safety can provide assistance with respirator selection (459-2553, ehs@ucsc.edu). Students may purchase N95 masks at the Student Health Center pharmacy. Everyone can help protect air quality inside our buildings by keeping windows and doors closed.